Spending time with friends and family is our favourite part of the festive season. Whatever festive feast you are preparing, there’s room to spice it up and add some Indian flavour. 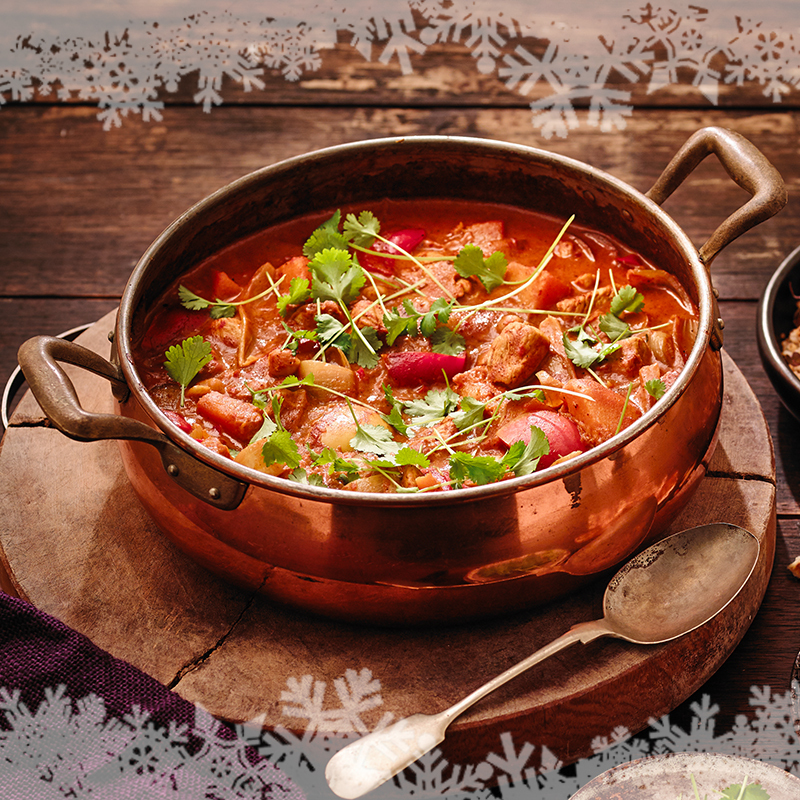 We use our expertise in spice blending to create festive recipes full of the flavours of aromatic spices from our Madras, Korma and Jalfrezi Spice Pastes -­ exactly what you need to prepare a festive feast or create something delicious with your leftovers. Whether you want to ditch the turkey sandwiches for Boxing Day or add a spoonful of creativity to your Christmas meal, these recipes will get the whole family excited about Turkey. If you fancy a Christmas meal with a difference try our Turkey Steaks with Jalfrezi Sauce served with Cumin Potatoes. The marinade made from our Jalfrezi Spice Paste and a few fresh spices will have your taste buds tingling! Turkey curry is a leftover staple in most houses, but our recipes for Turkey Madras and Turkey and Apricot Korma will kick the flavour up a notch. Both curries are simple to prepare and perfect for feeding a crowd. Traditionally in India, an array of food is served in the centre of the table and everyone helps themselves. We couldn’t imagine a better way to get everyone sharing and talking around the dinner table. Serve your curries with delicious Naans, Pappadums, Pickles and Chutneys to make a feast your family won’t be able to resist. Our family love all of these recipes and we have many happy memories of the times we have spent cooking and sharing them. We wish you and yours a flavour-­filled festive season! A real change from chicken, these turkey steaks taste great in a marinade made from our delicious Jalfrezi Spice Paste. The extra spices I've added really sharpen up the bold flavours of the Jalfrezi sauce. This dish is tasty, succulent and incredibly flavoursome. If your family can handle a nice dose of spice during the festive period, then don’t hold back on serving up this festive Madras. Coriander, cumin, turmeric and chillies in our Madras paste bring a whole new lease of life to those leftovers. Masala Jeera Aloo, or cumin-spiced potatoes, is one of our favourite side dishes. They make the perfect Christmas side along with our Korma-spiced Brussels sprouts, and will add a touch of India to any meal! Our Southern Indian inspired Brussels Sprouts will liven up your festive dinner table. Using our Korma Spice Paste, this sweet and mildly spiced side is suitable for the whole family. Is Britain a nation of Snappers or Smashers, or are there more unique Pappadum rituals out there?